I promised Woolly that I’d post a chicken soup favorite of mine and by golly, I’m doing it. Seems fitting as it has been snowing since this afternoon (big grin here). What did I tell ya? March means psycho weather: sunny and warm, stormy and snowy. It’s all good to me. Sort of like a degustation. See here now, my good man installed new blinds in our great room this week! There was a sale at [twenty] three-day blinds and we made the move to replace those old ones that came with the house. No offense to M&B, from whom we bought the house because we love those ladies like nobody’s business, but these dual cell honeycomb blinds are soooooo energy efficient and the diffuse lighting Rocks My World. Whooooooo! 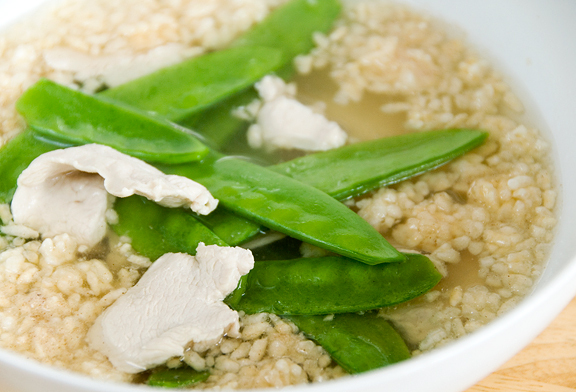 Chicken sizzling rice soup was one of my favorites to order in Chinese restaurants when I was a kid. The sizzling rice was the main event as it slid into the soup and – sizzled. So as some of you know, I can’t read Chinese. I shop for most Chinese groceries by sight and pattern recognition. Can’t tell you how much it screwed me over when one of the brands I grew up with changed their label design… If you decide to make your own sizzling rice (which involves frying and other things that I avoid by buying it) then no worries – although it does remove the whole “easy peasy” concept. If you purchase it, this is the only brand I’ve been able to find out here in landlocked country. 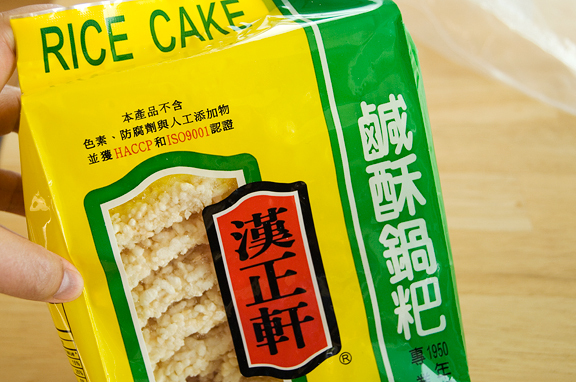 The translation of “rice cake” can lead to many things that are not these fried rice cakes, so just be warned if you flag down the grocer for help in an Asian market, okay? 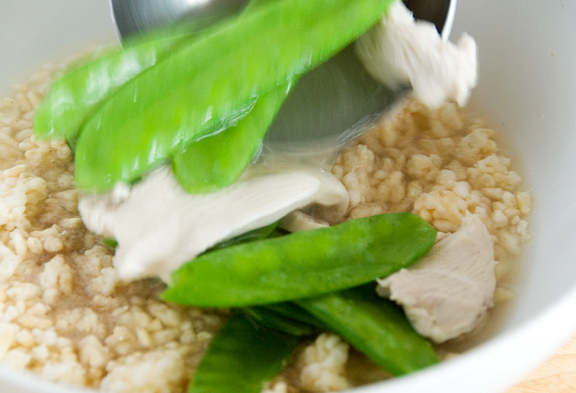 I’ve seen some people add carrots and other vegetables to this soup, but really, I think snow peas and chicken (or fish) do the trick just fine. I have a habit of picking snow peas one by one. It’s something I learned from my grandma. I can’t stand limp snow peas. That’s just… perverse. I pick the ends off of the snow peas and try to remove the woody strands. The chicken is just chicken breast sliced against the grain. Obviously homemade chicken broth is going to kick canned chicken broth in the balls, but canned works here. I actually made this batch with half homemade and half store-bought because I ran out of the homemade. Bring it to a boil. 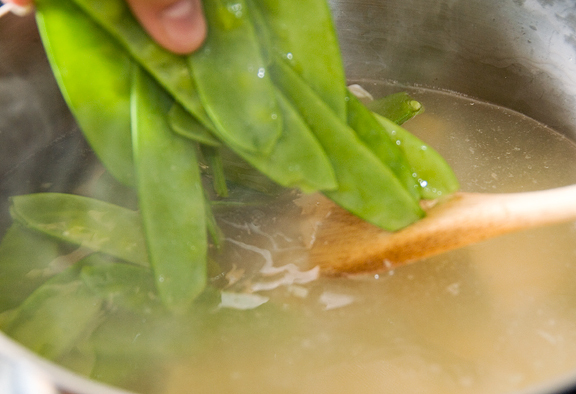 The snow peas cook in no time flat. Once you add them, turn off the heat and get the ladle ready. Smash a rice cake or two in a bowl and sprinkle with some white pepper before pouring the soup over top. Oh, I guess the whole reason I ordered the soup as a kid was for the fanfare of watching the little fried rice bits tumble to their sizzling demise in the soup. So if you want to dazzle your friends, you can add the rice last. As an adult, it is now the eatin’ and not so much the sizzlin’ that I love. Easy peasy, kids. 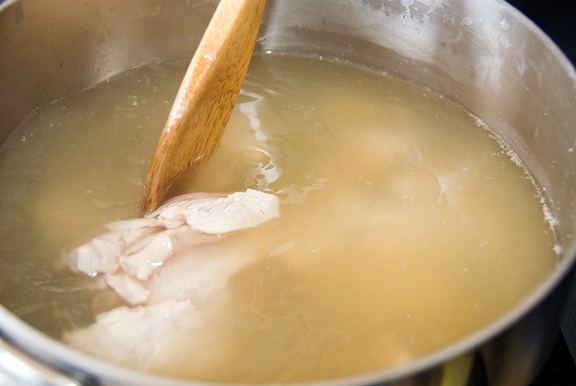 Bring broth to boil over high heat. Add chicken and stir to separate the slices. 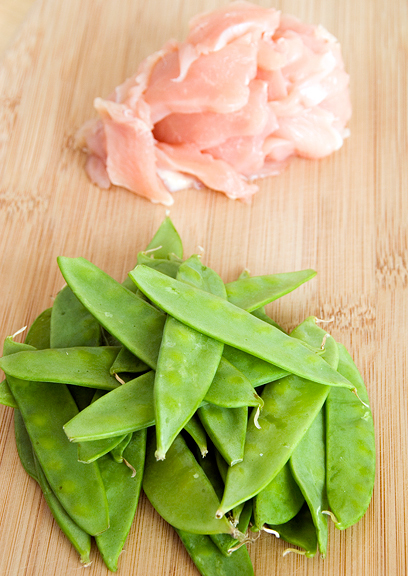 When chicken is nearly cooked, add the snow peas. Remove from heat. Ladle soup into bowls and sprinkle crushed rice cakes over the soup. Season to taste with white pepper. I’ve never heard of this soup before. I dig the the concept, though. I also pick the ends off snow peas as well as the woody strands – all the while knowing that it may be inconsequential to the final taste/texture — but that is the way mother taught us. I guess certain cooking habits can’t be forgotten. I would love to try these with my friend’s children next time. Thank you, thank you… oh and did I say thank you? I will be putting this to good use on the weekend. I had made a chicken soup last week that I didn’t totally hate but still haven’t satisfied my need. Also seeing as we just had 3 more snow storms this week and have set a record for snow fall that has lasted since 1939, I need to eat some warm hearty soup. 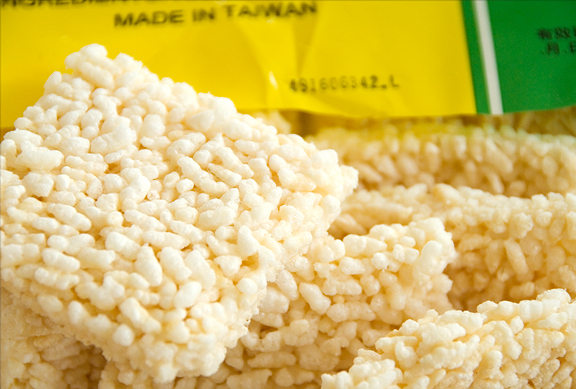 I will be going in to city (Toronto) today so I will swing by the food market and search for the recommended rice cakes. Strangely enough I was just commenting on how I worked in a Chinese restaurant for 3 years, and I have had a soup similar to the one posted here but it had chicken feet in it (Not a huge fan of chicken feet BTW) I will let you know how it goes! Oh and in case you didn’t hear me THANK YOU!! Wow, the soup looks amazing, but I can’t get over how dreamy your great room is! 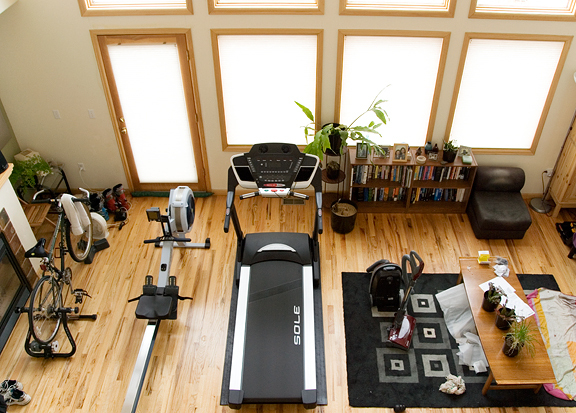 A trainer, a rower, a treadmill, oh my!! 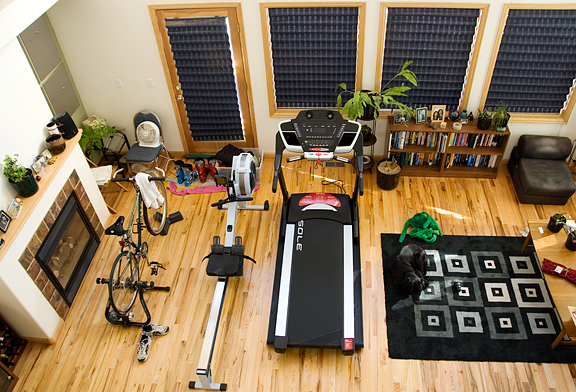 Plus a rug for floor exercises, and oooh! I see some T2s in the corner! I have a couple of our windows with the honeycomb. I want all of them with it. Looks great…as does the soup. Yum – that soup looks great & easy. Just what I need on late days! I think that we could play the “how many differences do you see in the picture” game ;) By the way, are those T-races standing next to the T2s? My creature lubs his T-races. I’ve seen a couple different brands down here of these rice crackers and have eaten these before with peanut butter. Kinda dry, kinda hard. I never knew these were used in soup…wish I knew that. I would have made a peanut butter sizzling rice soup! Your soup looks comforting, you room looks healthy (where’s the nordic trac ? ), and your blinds look great. But where’s the pup? That looks delicious. What a simple recipe. I don’t know that I have seen that type of soup here. I wonder if they have these type of crackers? I was just wondering how to justify buying these crackers at the Asian market the other day…now I know! Lovely soup! The new blinds are great! That soup looks good! I would never have thought to add rice crackers! I went to China town this week looking for a few things including sichuan peppercorns. I left the store empty handed as no one knew what I was talking about. I went online and found the characters, wrote them down and went back for a second try. This time I got exactly what I wanted. Woolly – dude, you’re welcome! I’m seriously jealous that you have Toronto at your fingertips, because we got nada by comparison. I hope the soup works for ya. Yeah, I’m not a fan of chicken feet either, but my mom and grandma are nutso over them! Amanda – awww, that’s so great! Good on ya. KatieC – oh, ha ha. Well, I have a personal gym because my chemotherapy renders me immuno-compromised and I was told to stay away from public gyms. Seeing as I can’t get outside to workout much because of my condition, we decided I could train on my up days at home :) I’d go nuts if I couldn’t workout. Peabody – I know what you mean. It took us almost 3 years to replace (or just install) honeycomb in all of our windows. I think we’re pretty much done (but it cost us – which is why we took so long). Liz – yeah, I noticed that the room is far messier now than before… I blame it on the chemo ;) Nope, those are both T2Xs – the blue are the ladies and the red are the mens! WoRC – no need for a nordic trac what with all the snow we have! :) we have a lot of xcountry trails around our neighborhood – it’s awesome. not as awesome when the dog is running around like a maniac… don’t you see the pup in the before shot? she’s curled up on the carpet next to the green plush spider toy. hee hee. Gretchen – oooh, yeah, I don’t know if they carry this kind of rice cake where you are. An alternative is to fry some rice (they say uncooked rice?) or to take cooked rice and sprinkle it with oil and spread it on a baking sheet and bake for an hour at 300 F and to check to make sure it doesn’t burn. I don’t know if that will work cause I’ve never tried it – but in case you can’t find it in stores, that might be an option? Kevin – you are so resourceful! I’m jealous of your access to Chinatown :( That said, you should have no trouble finding these rice cracker squares for the soup! I love this! It looks so fresh and healthy. The perfect antidote to all of those heavy Easter pies and corned beef! Ellie – you’d be surprised. I didn’t think my local store carried them, but I found them tucked away in some random corner! You should inquire if they have them. Jaime – Great! I hope you can get your hands on the fried rice cakes! I have searched my local Asian stores for the fried rice cakes. I do not know where to get that particular type. I tried to use a substitute but it didn’t work very well. Any ideas? Hi Jen, This is the first time I’m on your site. I’m excited to have found it! I don’t cook very well, so your step-by-step instructions with pictures help me greatly. I am a soup person and I’ll try this recipe. I’ll probably add shreds of carrots to the soup. I like my food with colors. :) Glad to have found your site! Kelly – Hmmm, I just checked a cookbook of mine that says you can make your own – but it’s a bit tedious. You basically make Chinese rice (sticky steamed rice) and allow a crust to form on the bottom of the pan. Remove all of the rice (set aside to use for something else) except for that crust. Remove the crust in chunks. Then you deep fry it in like 375°F oil for 45 seconds until golden and popping and remove it. That is the sizzling rice. I’m also wondering though if you can’t just use Chinese steamed rice and fry it up the same way? Hope that helps, but definitely keep looking – it’s much easier if you can buy it. I made this today for dinner – i was so excited when i found the rice cakes in the chinese store – the exact same brand too :) I added a couple of drops of sesame oil and it was perfect. I’m definitely going to make this in the future, especially since autumn is just around the corner. I made this today but I failed at it :( Think I got the wrong sizzling rice. I’m so trying again if I find that brand though! I’ve never seen this soup before and I’ve been to my share of Chinese restaurants. It looks so simple — my kind of recipe. Jen Yu — I just discovered your blog via Chef John’s videos. I can’t wait to try out some recipes. Especially the Asian ones! Can i use instant rice to make my own rice cakes for this soup??? elaine – uh, I don’t think so. These rice cakes are sort of… fried. I think the texture would be totally different. I have tried it with spinach instead of snow peas! Great stuff!! Thank you for the recipe! My family will be happy! I use homemade stock and add sliced cabbage. Homemade rice cakes and a little soy sauce and sesame oil. Anyway which ever veggie you use it’s good stuff!!!!!!!!!!!! I just want to say THANK YOU SO VERY MUCH! Carbon copy and taste to my childhood favorite froom my families favorite restaurant! Just had to add bamboo shoots and mushrooms.